In a large bowl, whisk together Bisquick™, eggs and milk until smooth. Divide the batter into six portions, around 1/3 cup each, giving a little extra to the bowls for the red and orange colors. 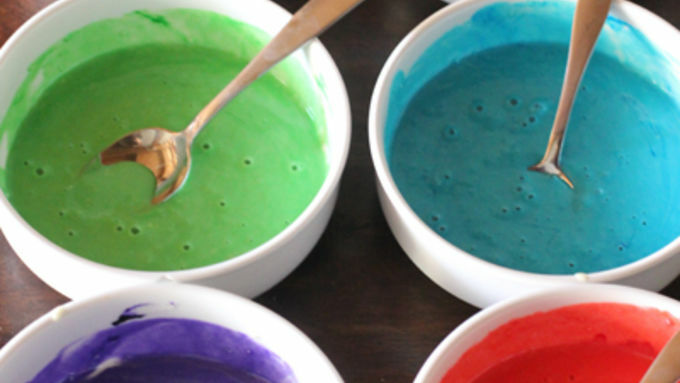 Use gel food coloring (red, orange, yellow, green, blue, purple) to color each bowl of batter to your desired vibrancy. Whisk in food coloring until evenly blended. Transfer each color of batter to its own piping bag and cut off the tips (careful not to spill the batter). 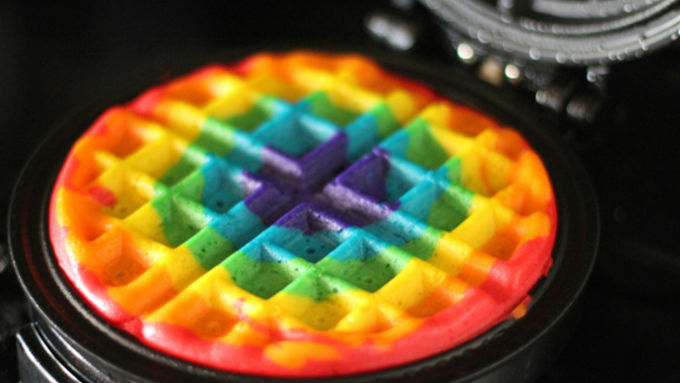 Carefully pour each color into a heated circle waffle maker to make your rainbow, starting with red, then orange, yellow, green, blue and purple. Cook according to waffle maker instructions. Remove, and repeat with remaining batter. Cut each waffle in half. Serve with whipped cream for clouds and Lucky Charms™ as the treasure at the end of the rainbow. 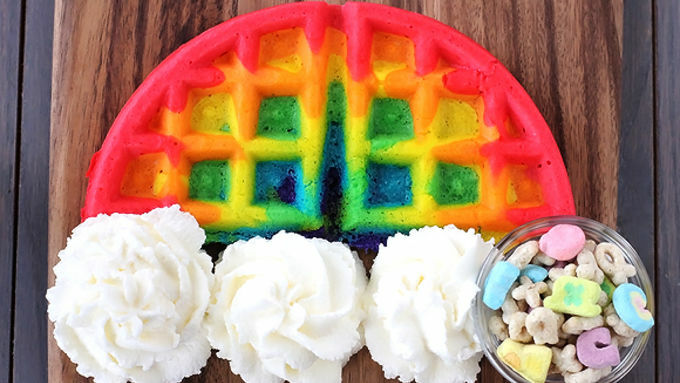 Follow these easy, colorful Rainbow Waffles with whipped cream clouds to the end of the rainbow, and you'll find a mini pot of treasure! Can you imagine a more fun way to begin the day?!?!? 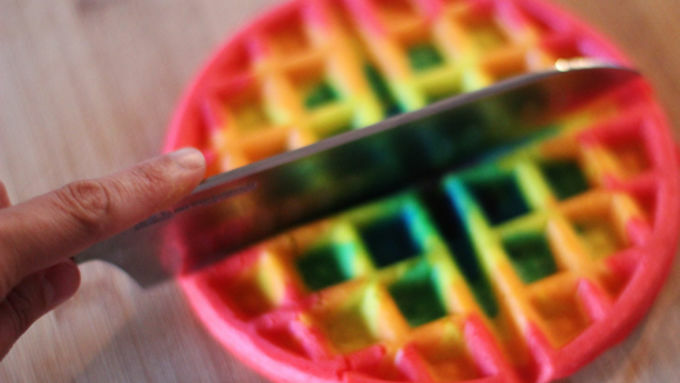 These cute waffles are actually much easier than you think, and are a blast to make! Then top them with some whipped cream “clouds” and my favorite little “treasure” at the end of the rainbow – some Lucky Charms! Cute? Oh so cute! 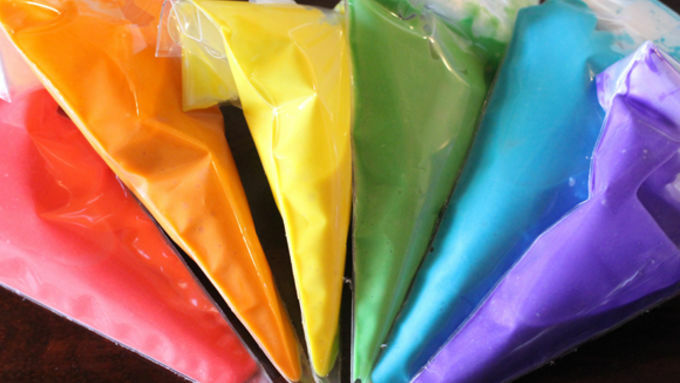 For my batter use gel food coloring to make nice and vibrant colors. Be sure to portion your batter so that the larger colors (like red and orange) have a little extra batter. Then pop each color of batter into a piping bag. (Or you can use Ziplocks and just cut the end off, OR just spoon in the batter.) For extra credit points, you can also make some cute blue clouds using the blue batter. Or you can go for the real deal and make some fluffy whipped cream clouds! Over-beat your whipped cream just a tad to make it a little ruffle-y like clouds. Then serve with some Lucky Charms as your treasure, and enjoy tasting the rainbow! 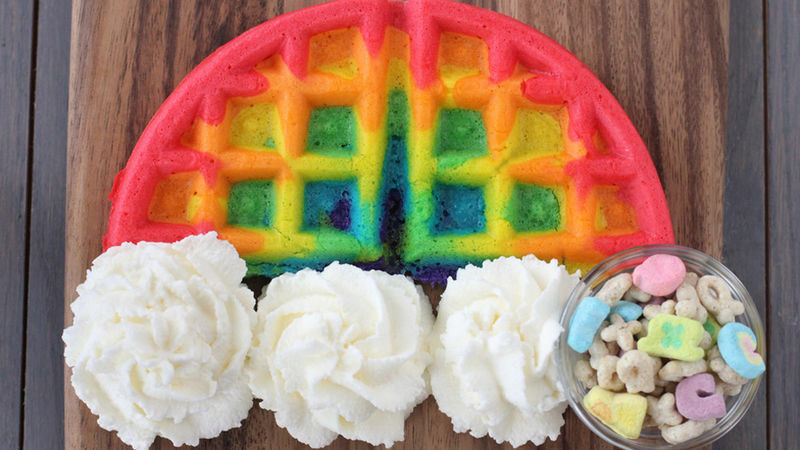 If the rainbow waffles have got you feeling inspired, check out the rest of our waffle wonders!